Ultrasonic Array Technique for the Inspection of Copper Lined Canisters for Nuclear Waste Fuel. Ultrasonic array technique for assessing the integrity of the circumferential electron beam weld between the lid and walls of copper canisters is presented in the paper. The results of laboratory verification of the performance of the ultrasonic array system on real canister samples are presented. A method for suppression of grain noise scattered from the internal copper structure based on digital filtering B-scan images is verified in this application. Ultrasonic arrays offer a number of advantages in NDE applications, the most important is electronic beamforming and scanning enabling generation of the desired field distributions and defect insonification from different directions resulting in improved defect detection, and characterization. The applicability of linear array technique for inspection of copper lined canisters for nuclear waste fuel has been investigated recently at Uppsala University. The objective of this project is development of ultrasonic array technique for assessing the integrity of the circumferential electron beam (EB) weld between the lid and walls of copper lined canisters developed by SKB (Swedish Nuclear Fuels and Waste Management Co.) for encapsulation of nuclear waste. Due to the radiation emitted by the nuclear waste encapsulated in the canisters the inspection must be carried out completely automatically. In order to achieve a very high level of confidence to the NDT results of the copper canisters asessment, the inspection system should be capable of inspecting 100% of cimcurferential weld zone in thick section copper. An ultrasonic array system consisting of a linear ultrasonic array, made of piezoelectric composite material, and a computer controlled multi-channel electronics was proposed as a solution to this problem. Modern array technique which has become recently commercially available for NDT applications has a great potential in this application. The array system chosen for this application enables electronic focusing and rapid electronic scanning eliminating the use of complicated mechanical scanner. Secondly, it is capable of reducing the influence of grain noise by using a combination of focused sound field and signal processing. Thirdly, it is characterized by an inherent flexibility enabling 100% inspection of the weld zone even if the weld is not parallel to the upper surface. Our present research activity in this project addresses two issues: the development of software tools for efficient beam-forming, and a laboratory verification of the performance of ultrasonic array system on real EB welded canister samples. A special attention is paid to ultrasonic grain noise scattered by the internal copper structure. A method for grain noise suppression by electronic filtering B-scan images is verified in this application. Here we present some recent results obtained during the inspection of EB welded copper test blocks containing both artificial and natural defects. Figure 1 Block diagram of the experimental set up. All measurements have been performed using 128 channel ultrasonic array system Allin from NDT Systems, France. The Allin System was connected to a 3 MHz linear array from Imasonic. The array was made of piezoelectric composite material and had 64 elements with dimensions 1 by 33.5 mm. The array was fast focused in one plane (cylindrical focus with focal distance 190 mm in water) and was electronically focused in the other plane. The Allin enabled focusing both in the emission and reception and electronic scanning using an aperture up to 32 elements. Besides scanning and beamforming, the Allin performed also data acquisition and steering of the mechanical scanner used for guiding the array. The Allin enabled storing all the measured data in real-time, which means that all RF signals included in the acquired B-scans can be stored. Thus when inspecting a 2D surface, a sequence of B- scans is stored forming ''data cube''. The stored data can then be processed and presented off- line and the desired C-scans can be calculated. This feature has been used extensively during the experiments. Figure 2 Immersion inspection of the canister blocks. The test blocks were inspected in immersion in setup shown in Figure 2, using a mechanical scanner from Newport for guiding the array (see  for details). The scanner was controlled by Allin and the data was acquired automatically with the spatial resolution 1 mm in both axes. The specimens (sections of weld referred to as W123 by TWI)) were scanned in this way that the interesting weld zone was inspected completely. The sections of W123, which are sections of the ring, were inspected in several parallel rectangular zones. All the data were stored in a data cube and C-scans were extracted after the inspection. All the specimens were inspected in pulse echo mode using either the array or a single immersion transducer. The array was used in an electronic scanning mode, which means that the B-scan was formed electronically by shifting a number of elements (aperture) along the array. The aperture of 16 elements has been chosen for all the measurements as a compromise between an efficient beam forming and a width of the electronic scanning. With the 64 element array this aperture yields B-scans 49 mm wide and enables satisfactory focusing at 60 mm under copper surface. A single ultrasonic transducer was used for comparison and reference. The transducer was of type Videoscan from Panametrics with center frequency 3.5 MHz and diameter 10 mm. Figure 3Ultrasonic flaw indications in weld W123-3. C-scan image of the block obtained using the focused array(a). Horizontal C-scan profile along lines 61 mm (b). Figure 4 Ultrasonic flaw indications in weld W123-3. C-scan image of the block obtained using the single transducer (a). Horizontal C-scan profile along lines 60 mm (b). All blocks were inspected in immersion using Allin with the array illuminating them from the top, see Figure 2. Each block was scanned in 2 parallel paths and the results were then compounded and presented in one C-scan image. However, due to the constant gain in different array apertures and precision of the mechanical scanner the borders between the two C-scan sections cannot be distinguished. Please note that the C-scan images are not proportional to the inspected area since they have different scales on the axes. As an example the C-scan obtained for the block W123-3 is presented in Figure 3. At least six clear indications can be seen in the C-scan of this block, two very strong at position x = 71 mm, other two located at x = 242 mm and at the positions x = 52 and 86 mm. The indications are well correlated with the indications obtained by TWI in manulal ultrasonic inspection (see  for details). Block W123-3 has also been inspected using a single 3.5 MHz transducer from Panametrics, the results obtained are shown in Figure 4. This inspection was performed as a reference enabling comparison of the results obtained with the array to those acquired using the conventional transducer. Comparing the inspection results shown in the Figure 4 with those obtained by the array (Figure 3) we can see, despite the different color scale, that they contain essentially the same information, but the transducer has obviously poor spatial resolution. The peaks in the C-scan profiles are much broader for the transducer and less details are reproduced. Signal to noise ratio is also reduced due to the spatial averaging resulting from the low resolution of the transducer. Copper has distinct grain structure which depends on the manufacturing process; it is well known that this structure can be changed by thermal treatment, forging, rolling, etc. Metals with distinct coarse grains are difficult to inspect ultrasonically due to the attenuation and backscattering from the grain boundaries. This effect becomes very distinct for the ultrasonic waves with lengths in the same range as the grain size. In pulse echo inspection small reflections scattered from the grain boundaries appear in the received signal as a kind of noise often referred to as grain noise. Grain noise is different from thermal noise so that it does not vary with time. This means that the for each transducer position one particular noise realization is obtained, which is observed as a constant signal on the screen. Due to this fact the grain noise cannot be reduced by averaging in time but it can be reduced by averaging over different transducer positions, the procedure called spatial diversity. Another way to reduce the grain noise is to apply frequency diversity algorithms, referred to as split spectrum processing (SSP). The SSP is based on the analysis of narrow band signals obtained by splitting the transducer frequency band in a number of small frequency bands by means of FFT (fast Fourier transform). Several SSP algorithms have been proposed with different schemes of analysis of split signals . Their common weak side is sensitivity to parameters set by the operator and degraded temporal resolution of the output signal. A number of more robust schemes has been proposed such as cut spectrum or consecutive polarity spectrum , and more recently new algorithms based on a concept of noncoherent detection were developed . The latter algorithm was tested on ultrasonic data obtained from copper block CU1 with coarse grain structure. The noncoherent detector (NCD) is a nonlinear filter used for detecting transients embedded in a background noise in radar and communication applications. It has been adopted to ultrasonic noise suppression by M. Gustafsson, the details have been presented in , . The idea is to construct a filter for processing the original ultrasonic signal to yield a signal in which the echoes are more likely to be detected. The filter suppresses the ultrasonic clutter (grain noise) and maximizes the probability of detecting certain family of transients. The noise suppression is based on the estimated noise covariance matrix and the detector is designed based on a prototype transient. The NCD is more advanced than an ordinary matched filter since it aims at detecting a member of a predefined transient family. In our case the family has been defined as a set of transients with given envelope and center frequency but unknown phase. The NCD algorithm has been implemented using Matlab (r) (from MathWorks) so that it can be used for processing B-scan images acquired from the Allin. The Matlab NCD algorithm operates in an interactive mode when designing the filters. First, the operator has to choose a region in the B-scan containing only ultrasonic clutter which can be used for the covariance estimation, then the prototype is designed in a half automatic way. The NCD is then tested on some known data and if the result is satisfactory the NCD can be then used for processing other ultrasonic B-scan images. Figure 5 . Example of raw ultrasonic data from the block CU1. C-scan image (a), horizontal C-scan profile at y = 25 mm (b). The NCD has been tested using data from the inspection of block CU1 containing a number of small round bottom holes prepared for evaluation of the resolution of ultrasonic transducers. The block was inspected using the array focused at the depth 30 mm in copper in the setup shown in Figure 2. From the acquired data cube an amplitude C-scan was obtained so that the gate used for amplitude extraction covered almost the whole depth of the block. The raw C- scan obtained in this way shown in Figure 5 is quite noisy and the responses of two bottom holes at x = approx. 200 mm can be hardly seen in the C-scan, and impossible to detect in the respective profile (c). Each B-scan image in the acquired data cube was subsequently processed using the NCD and stored. This resulted in a processed data cube and new C-scans could be extracted from this data. The C-scan extracted from this data is shown in Figure 6(a). The result is impressive even for the specialist working with ultrasonic noise suppression (especially the original color image )! The two bottom holes are clearly visible in the C-scan and in the profile (b) and several strong reflections appeared in the bottom lines of the C-scan (see profile (c)). The reflections are coming from the ends of side drilled holes present in this part of the block. Comparing the B- scans before and after processing we can see a clear noise reduction and signal to noise improvement for the indications (cf. the B-scans (i) and A-scans (h)). The horizontal line apparent at y = 42 mm at the Figure 6a, which can also be seen in the B- scans is probably reflection from the internal inhomogenous structure in the block. 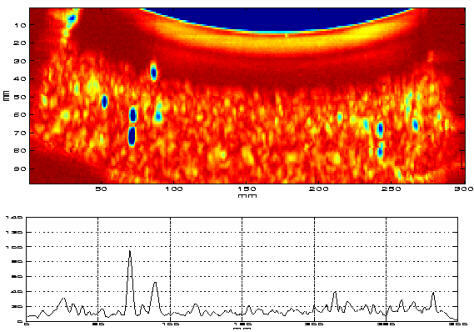 Ultrasonic array technique for assessing the integrity of the circumferential weld in copper canisters for spent nuclear fuel was presented in the paper. The results of laboratory verification of the performance of the ultrasonic array system proposed for the ultrasonic inspection has shown that the technique is rapid and reliable. The array system chosen for this application enables electronic focusing and rapid electronic scanning eliminating the use of complicated mechanical scanner. Moreover, it is characterized by an inherent flexibility enabling 100% inspection of the weld zone even if the weld would not be parallel to the upper surface. The results obtained after the electronic processing used for grain noise reduction are very encouraging and indicate that the grain noise can to some extend be reduced by electronic post- processing of the raw ultrasonic signals. More work is required to verify the algorithm and estimate its performance for various copper grades. It should be noted however that the example shown above concerned only reduction of the pure grain noise in the parent material which does not contain weld (block CU1 does not have any weld). Reducing the backscattering coming from the weld structure in a similar way can be more complicated due to the significant anisotropy observed in such structure. This study was funded by the Swedish Nuclear Fuel and Waste Management CO in the project 61230-96-19. The authors would like to acknowledge the assistance of Eider Martinez de la Cruz for performing the ultrasonic measurements. T. Stepinski, P. Wu, Ultrasonic Inspection of Nuclear Copper Canisters, SKB Report 97-06, August 1997. T. Stepinski, L. Ericsson , B. Eriksson and M. Gustafsson, Quasi Frequency Diversity Processing of Ultrasonic Signals - A Review, in Advances in Signal Processing for Non-Destructive Evaluation of Materials, X.P.V. Maldague, ed. Kluwer Academic Publ., 1994, pp. 49-58. M.G. Gustafsson, Statistical Aspects of the Split Spectrum Technique, Doctoral Dissertation, Acta Universitatis Upsaliensis, Uppsala University, Sweden 1995, ISBN 91-554-3490-8. M.G. Gustafsson, "Nonliner Ultrasonic Clutter Supression Using Noncoherent Detector Statistics and Split Spectrum Processsing", Uppsala University Report UPTEC 97 063R, April 1997.